ThinkGeek.com attributes a lot of its success to finding a niche market and catering to its specific audience in unique ways. The online retailer’s target audience includes sci-fi addicts, computer-aficionados, practical jokers, and other “geeky” groups. Most eCommerce businesses know that creating unique product descriptions can help engage consumers, and ThinkGeek does this perfectly. Their product descriptions and videos are often hilarious, and the overall vibe of the website is playful and fun. The takeaway? Don’t underestimate the value of clever writing and clever merchandise. For most eCommerce companies, success does not spring up overnight. Consider Amazon, the eCommerce giant that is one of America’s most popular stores. Amazon didn’t make a profit for seven years after its initial start, but founder Jeff Bezos knew that success would eventually come, and he continued to put effort into his business. His e-book strategy particularly paid off. When e-books first hit the market, Amazon sold them under the market value, which resulted in a loss for Amazon. However, once the prices for e-books dropped, Amazon had already become the go-to place to purchase them, which allowed Amazon to successfully launch the Kindle. If anyone wants to read a feel-good eCommerce success story, just look to Nasty Gal founder, Sophia Amoruso. Amoruso went from hardly being able to afford medical care to becoming the CEO of a multi-million-dollarfashion empire. Part of her success may have had to do with Amoruso’s choice of models. Amoruso chose models for her clothing that inspired other women and that made them feel good wearing her clothes. This emphasis on product display continues today and plays an important part in the fashion retailer’s success. Understanding the ins and outs of a consumer’s purchasing habits can be difficult, but the online retailer known as Overstock has used technology to understand these buying habits to successfully rise to the top. Overstock realized the importance of marketing to target their consumers and invested in technology that supported marketing analytics. Many online retailers have problems with shopping cart abandonment, but analyzing customer data with custom eCommerce tools can help business owners convert online visitors into customers. Many businesses know that treating customer’s right will go a long way, and the online retailer known as Zappos understands this better than anyone. In fact, Zappos has gone to some extreme lengths to make things right with customers, and these acts quickly spread around the web and boosted their reputation. In addition to these kind acts, Zappos offers free returns with no questions asked, and it encourages customers to order multiple sizes and simply return the ones that don’t fit. How does this not hurt their profit margin? Because Zappos knows that excellent customer service is an investment that pays off. The top players in eCommerce, such as ModCloth, know that building a community around your business ultimately leads to sales. ModCloth, which sells vintage-inspired and indie clothing, became successful in part due to their use of social media as a way to connect with consumers rather than as a marketing tool.By befriending their customers and laying off the sales pitches, Modcloth has gathered loyal customers who are more willing to buy from them. Modcloth founders Eric Koger and Susan Greg Koger also pride themselves on being good listeners to their customers, which helps boost customer engagement. The success of these big name eCommerce sites all have one thing in common: They were dedicated from the very beginning to providing their customers with a superior online shopping experience. By doing so, they were able to rise to the top and get ahead of their competition. 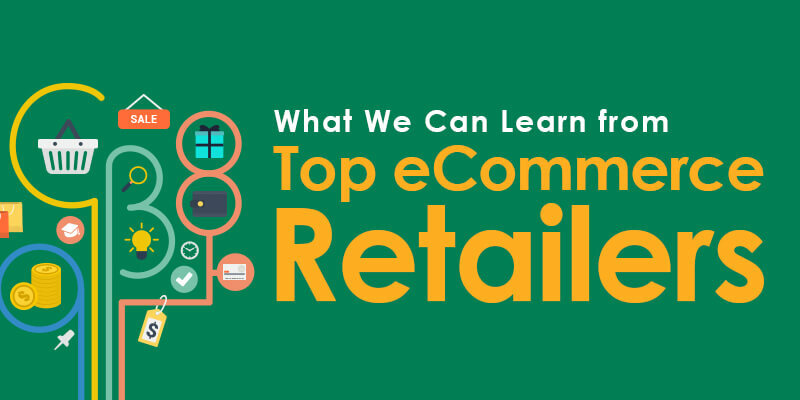 Every eCommerce business is different, but many could learn from these top eCommerce stores and use their strategies to achieve success.